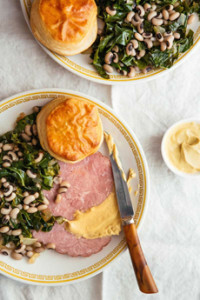 It’s a Southern tradition to eat black-eyed peas on New Year’s Day for prosperity in the new year. It may actually stem from an ancient Sephardic Jewish custom of eating them on Rosh Hashanah, the Jewish new year. This “good luck” tradition is recorded in the Babylonian Talmud, compiled circa 500 C.E., and includes other good luck foods such as beets, dates, leeks and spinach. This custom is still followed by Israeli Jews and Sephardic Jews the world over. Black-eyed peas are also called black-eyed beans, because they are a subspecies of the cowpea, called a pea but botanical a bean (here’s the difference). The beans are beige with a black “eye” on one side. Beans are a nutritional powerhouse as well as a very economical source of protein. Making an effort to have them on New Year’s Day may give you more luck, in the form of adding beans at least once a week to your diet. Beans can be enjoyed in a cold bean salad or mixed into a green salad, as a hot bean side or main dish, pureed into a dip and made into soup. There are even bean desserts; you may have encountered red bean ice cream and topping at Japanese restaurants (they’re azuki beans, sometimes mis-translated as adzuki beans). Black-eyed peas are actually beans. Photo © ViktorLugovskoy | IST. 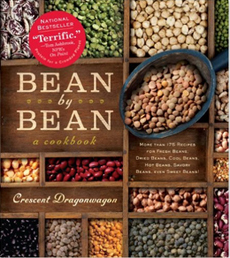 Take a look at the cookbook Bean By Bean: More than 175 Recipes for Fresh Beans, Dried Beans, Cool Beans, Hot Beans, Savory Beans, Even Sweet Beans. Peas and beans are both members of the same botanical family, Fabaceae, but belong to different genuses. Here are the details. Here’s the surprise: Peas and beans are actually fruits in botanical taxonomy, since they contain seeds and developed from the ovary of a flower. 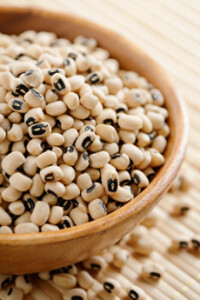 Black-eyed peas and other beans are typically sold dried, and must be soaked a day in advance before cooking. Here’s a tip: rinsing the soaking water every few hours removes the compounds that cause flatulence in some people! You can also buy pre-soaked black-eyed peas and even pre-steamed back-eyed peas, ready to heat and eat. But these will cost more than buying dried beans. This recipe takes just 15-20 minutes of active prep time, plus several hours of passive soaking time. See the photo below for your finished meal. *Collard greens are a member of the cruciferous vegetable family, Brassicaceae, which includes broccoli, cauliflower and other commonly-enjoyed, anti-carcinogenic vegetables. Collards are most similar to kale, although bok choy and mustard greens are also good substitutes. Food trivia: Collards contain as much calcium as milk! †A typical serving is 4 ounces of ham per person. If your group likes larger portions, plan accordingly. You can do the first two steps a day or two before you serve the dish. 1. PLACE the dried beans in a large pot and cover them with cold water. Soak them overnight; if you forget, you can soak them for at least 4 hours the day of preparation. When done soaking, strain the beans in a colander, rinse the pot, return the beans to the pot and cover them with fresh water. 2. ADD 2 bay leaves to the pot and set it over high heat. When the water reaches a rolling boil, turn the heat down to a simmer and cover the pot with a lid. Cook for 45 to 60 minutes, until the beans are velvety tender but not mushy. Dip a mug into the pot and reserve a bit of the starchy cooking liquid; then strain the beans and set aside. 5. HEAT 3 tablespoons of olive oil, more as needed, in a heavy-bottom pan. When the oil is hot, add the onions and a pinch of chile flakes and cook for about 5-7 minutes, until they’re softened and translucent. 6. ADD the collard greens and turn the heat down to medium. Cook the greens and the onions together, occasionally tossing with tongs, for 10-12 minutes, until the greens are soft and tender. 7. ADD the beans to the pan and cook together for a few minutes, until the beans have warmed through. It it seems too dry, add a tablespoon or two of the reserved cooking water instead of more olive oil. Remove from the heat and season with a squeeze or two of lemon, plus a few pinches of salt and pepper to taste. Hoppin’ John is a traditional Southern dish enjoyed on New Year’s Eve or New Year’s Day to usher in a year of prosperity. It combines several good luck foods: beans, greens, pork and rice. Some recipes substitute ham hock, fatback, or country sausage for the conventional bacon; some add green peas, a splash of vinegar and/or favorite spices. Make Hoppin’ John as a hearty side with your favorite protein and a green salad. Here’s a Hoppin’ John recipe, plus a list of other “good luck” foods. CHECK OUT THE DIFFERENT TYPES OF BEANS in our Bean Glossary.